Hello – Is It Me You’re Looking For??? I don’t get it. 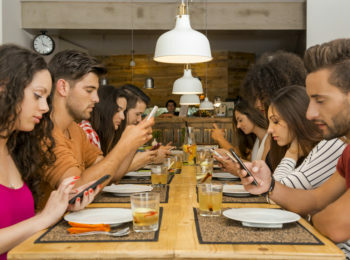 I mean, I truly don’t understand what is so important that everyone is constantly on their phone. And I’m not just talking about the young people who grew up with this appendage attached to their ear. It’s also the “older folks,” people my age, who can’t seem to survive 15 minutes without checking their phone. Now I know I sound like an old lady – like a GET OFF MY LAWN old lady – but I can’t be the only one who feels this way. A few nights ago, my husband and I planned a “date” night. We chose a lovely venue that offers a unique dining experience called The Vignette Dining Club. The idea is to make you feel like you are dining in someone’s home. They entertain small groups of approximately 16 people with an intimate atmosphere that celebrates good food, connecting with old friends and making new ones. As we were all seated and enjoying the delicious food, I turned to my right to hear what the chef was saying. He was describing the dish that was in front of us and how he prepared it. To my surprise and irritation, there were three people who were on their phones. REALLY! The teacher in me wanted to grab the phone from the woman next to me and scream: “You’re being rude!” Of course, I restrained myself, but it was really, really hard. We are having an artic blast in the Midwest. I’ve been born and raised in Chicago, so you would think I’d be used to the cold. But I swear, it has never been this frigid. As I sit in my home, wearing flannel everything and still feeling chilled, I couldn’t help but think about my trip to Churchill, Canada. 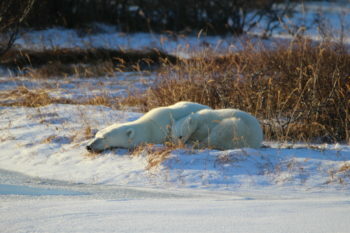 I traveled there a couple of years ago to see the polar bears emerge from hibernation and meander to the Hudson Bay, looking for food. It was truly one of the most amazing experiences of my life. Looking at the pictures, I was extremely touched by this one of a mother bear and her cub. They both seem so content and comfortable and trustful. Yes, that’s the word I’m looking for – trustful. They have both found their spot where they feel safe. That’s what I wish for you – and for me. To find your safe space, your snuggle-up-and-believe-everything-will-be-alright space. It’s nothing that can be ordered on Amazon or researched by Alexa. It’s a place you have to discover on your own. One that makes you feel all cozy inside with a belief that all is right with the world. Yes, that’s what I wish for you on this cold and frigid night. Along with a hot chocolate and a belief that warmer weather IS coming. Sometimes we can get overwhelmed with all the possible choices we have. Think about it. There was a time when you ordered a cup of coffee – that’s it. Coffee. Now??? We have an infinite number of decisions to make. Let’s see: I’ll have a blonde latte with soy milk and only one pump of vanilla, please. And that’s considered an easy order. I’ve heard others that are far more complicated. And it doesn’t stop there. We make choices when it comes to color and price and health and so much more. It’s no wonder we get overwhelmed and often paralyzed with the infinite number of possibilities we face every day. How do you get past this? Here’s the way I see it – When we start with a blank page we can create anything at all , we can decide on whatever is possible, and that can be very daunting and downright scary. Everything, both large and small, is a decision to be made and we become paralyzed. So, to help get through this, I’m trying to limit my list of choices. I’ve decided to pick three of whatever it is. Three – that’s it. Then I research those three and make my decision at that time. It’s tempting to check out everything that pops up on the internet, but I’ve gotten a lot better at hitting that delete button. So, the next time you are planning a vacation, deciding what to make for dinner or researching a new car, pick three, limit your choices, and research those. Don’t allow yourself to get bogged down with all the details. See if that works for you. It might make all those decisions a little bit easier. Now, back to my blonde latte with soy milk and only one pump of vanilla. 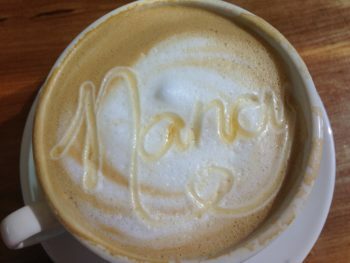 This barista even wrote my name in the foam. Nice choice! National Quitters Day. Have you heard of it? 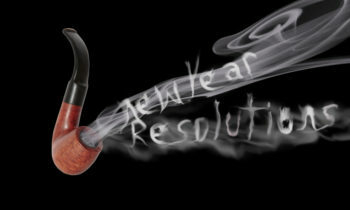 Apparently, it’s a day that has been set aside to recognize when most people abandon their New Year’s resolution. Yes, they’ve actually done research to show that your motivation begins to waiver on the second Friday in January. This year it was January 12th. So, all those goals you set, all those promises you made to yourself, are discarded. Whether you vowed to exercise more, spend less money or take more time for yourself, you leave all that behind and fall back into your old habits. It takes only two weeks to surrender to your old self. Being kinder to our neighbor, our family, ourselves! I’m going to start my 1% tomorrow. NO – I’m going to start RIGHT NOW. Yes. I envision a healthier lifestyle for myself. I’m packing my bag for the gym tonight and won’t let excuses get in my way. Yes, my 1% starts right now. What about you? Want to give it a try? In my last blog, I talked about fitting the pieces of the New Year together. I got that idea from a 500- piece puzzle that was given to me over a year ago. I wasn’t eager to start it. In fact, it sat on the shelf for many, many months. Then for some reason, right before the holidays, I pulled it out, poured the pieces on a small card table, and began to piece it together. I got hooked. Every night, I sat at that table and tried to complete the scene that decorated the front of the box. I don’t understand it. I’m not a game person, and certainly not a puzzle person. 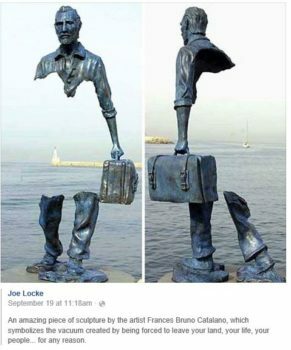 So why did this captivate me so much? Around this same time, a movie was released titled Puzzle about a woman who enters a jigsaw puzzle competition. Really? There’s such a thing??? Well, that movie came and went from the theaters. I never got around to watching it – until last night. And I found the story totally captivating. That’s it! That’s why I’m enjoying this puzzle so much. For one short part of my day, I’m guaranteed to make all the right choices. I don’t have to guess. Either the piece fits or it doesn’t. I have it all under control. For one short part of my day, I have all the answers. With the challenges we face every single day, and the choices we lament over wondering if we’ve made the right one, I welcome the relief of this puzzle. Whoops, there’s the piece that said I was going to lose 10 pounds. That one must have fallen on the floor. Yikes, here’s the piece that was supposed to bring me more business. That one must have stuck to another piece and I just didn’t see it. Uh-Oh, here’s the piece that was going to help me slow down and enjoy the things that are important to me That one must have stuck to the bottom of my shoe. There’s a lot of missing pieces and a lot of goals I didn’t quite accomplish, but you know what? I get to try again. It’s a New Year and I can make a promise to myself to pick up those missing pieces, turn them inside out and upside down, and work with them until they fit. I have the power to complete the picture that I see for my future. So, you see, you don’t have to throw the entire puzzle away. You just have to look at it differently and see how you can make 2019 a better year. 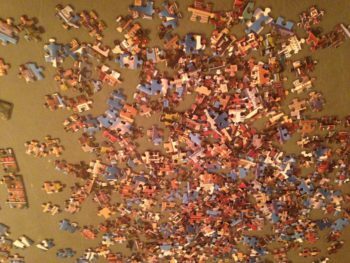 Personally, I doubt that my own puzzle will ever be completed – and I’ve come to accept that. My goal is to take my ever-changing life and cherish that unfinished puzzle, find the missing pieces that make it more complete, and be kind to myself, knowing I am doing the best that I can. I truly wish you all a New Year filled with all the love, happiness and success your heart can handle. After all, those are the most important pieces of all. Today, on Christmas day, I wish you love and peace and joy. May your life be filled with beauty and generosity and all the happiness your heart can hold. And above all, I wish that you never stop believing. 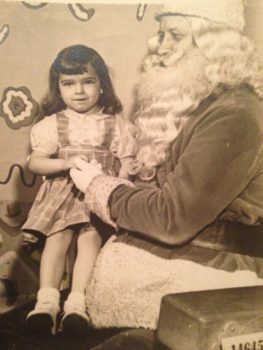 So many years ago, sitting on Santa’s lap, I believed that everything was possible. I never doubted that whatever I asked for would find its way under my Christmas tree. Now, more than 60 years later, I still believe. I trust that no matter what life throws my way, I will have friends and family who will reach out, hold my hand and tell me everything will be ok. 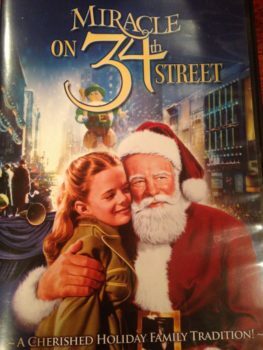 Miracle on 34th Street. That’s my favorite Christmas movie. Yes, it could be any one of those reasons, along with a dozen more. But the real reason is because it was my Dad’s favorite. Every year we would sit down in front of the TV, just the two of us, and watch it. And if you think about it, that wasn’t so easy to plan. This was before the days of DVDs, Netflix and On Demand. So we actually had to scour the TV Guide, find the time the movie was playing and make a date of it. Every single year my Dad would laugh out loud at the part where Santa bopped the psychiatrist on the head with his cane. That was his favorite part. I can still hear his laughter as though he was sitting right next to me. So, I guess you could say that my favorite movie has nothing to do with the story at all. It’s my favorite because of all the memories it brings back to me. It makes me feel warm and snuggly and reminds me of a love that I am so lucky to have known. A love of a father for his daughter. Every year I try to capture that feeling. I make a “date” with my Dad to watch the movie together. And every year I swear I can hear him laughing out loud and feel his love surround me. Superstitions! Whether my parents really believed in the superstitions they passed down to us or not, I’ll never know. But what I DO know is that they still stick with me today – more than sixty years later. To this day I can still hear my Mom saying: “Nancy, if you put your shoes on the table they will pinch your feet.” So, the other day, after returning from DSW Shoe Warehouse, my husband didn’t understand my yelp as he placed that box of shoes on our dining room table. Yes, some superstitions from my childhood still follow me today even though I am well aware they can’t possibly be true. Along with that comes the traditions I grew up with. You see, I am 100% Polish and was raised in a VERY ethnic neighborhood. Polish customs were part of my everyday life, especially at this time of year. One of the traditions I remember very clearly is the oplatek. It’s a Christmas wafer with a religious scene imprinted on it. Every Christmas Eve we would sit at the table, break off a small piece, hand it to the person next to us and offer them health, good luck and great fortune for the upcoming year. It was a sweet gesture filled with smiles and friendship and love. Do you have any customs that have been passed down from generation to generation? Are you creating new ones of your own? What do you hope your family and friends will remember in the years to come? Now that I’ve asked you those questions, I need to take a look at my own holiday celebrations. What can I create so that sixty years from now my friends and family will remember me – just like I remember my family sharing the oplatek. Thanks Mom and Dad. As I already mentioned last week – I LOVE the holiday season! Find some time this holiday season and try something new! Yes, that’s right. I’m challenging you to STOP, take a break, don’t worry about everything and everyone else, and find some time for a little fun. Carve out a few minutes to enjoy a little laughter. Every year I promise myself that I will try one new thing during the holidays. This year, it was Caroling at the Cave in Mt. Horeb, Wisconsin. It’s an actual cavern that you can tour year-round, and during the holidays they feature a women’s acapella group. With the cave glowing with candlelight and the beautiful voices echoing holiday tunes, I felt like I had been transported to Europe. It was quite magical. There was even an appearance by Santa Claus at the close of the program. 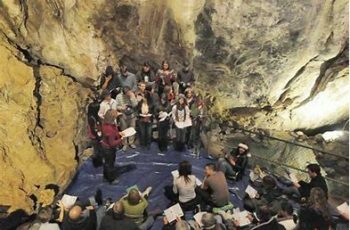 It appears as though Caroling at the Cave is quite popular and you can find these events in a number of different places. Check it out – Google it – and see if there is a Cave Caroling close to you. And if this doesn’t tickle your fancy, find something else that does. The point is to take a “time out” from all the holiday craziness and find something that makes your heart smile. And please, share your experience with us. We just may be able to add a few new things to our list for next year’s season.